This whole No Award thing came about last year when Liz and I were on a panel about Social Justice 101 and people kept asking for links to not-USAmerican SJ things and we struggled to provide them. And here we are, almost a year later! What that means is, Continuum is upon us in just 11 sleeps, and I got my final list of panels ahead of the program’s release yesterday afternoon. Check out the program and maybe come along! It can be a little exxy if you’re used to cons like Supanova, but it’s high quality and also you can come along on Friday night which is a gold coin donation and give it a go, if that’s your thing and you’re not sure. There’s programming from 3pm until midnight. I’m proud that you can read that program (note: I didn’t have anything to do with this program) and see a lot of the things in there that I tried to help along last year in terms of program diversity, understanding, conversations and just being really obviously queer and brown. Liz will be making her own post about her stuff shortly, but here is where you’ll be able to find me (when I’m not in the bar or loitering out by Purple Peanuts for delicious vegan food). The plan with this series of panels has always been to really open up and discuss a lot of the issues behind the representation of gender and sexuality issues in SFF. They’re combined as a triptych (across the entire weekend – including the first one being held during the gold coin donation opening evening) in part as acknowledgement that these issues are complicated and linked together and difficult to put boundaries on or definitions around. In Moving Beyond the Gender Binary, we’re talking about the ways in which beyond the gender binary is represented, and the ways in which it’s not – aliens coded as male or female, concepts of no gender futures, reaffirmation of the gender binary within the text as the right way. Othered Sexuality is about the lack of real translation or investigation when presenting sexuality in fantasy and science fiction, and the ways in which they all ultimately boil down to looking the same as what we’ve got now. And also you know how I love talking about othering, and the role of assuming the other and that there is an other, and what that means for your fiction in the real world. Gender Stereotypes is looking at the ways in which stereotypes are reinforced or subverted, successfully and not. I’ve got two solo presentations. Realistic Climate Dystopias was basically the inspiration for my article at The Toast: A Look at Australia’s Climate Change Dystopia. So it’ll be a lot like that, but less structured and at 11:00 am so I’ll probably be on my second coffee. Chinese Mythology is exactly what it sounds like, because I thought you all deserve to benefit from my thoughts and research on Dragon and his nine sons, the role of the Jade Emperor in creating culture, the mother of the earth, and the horrifying hells. I will also be on Created Languages, Borrowed Languages, Stolen Languages, which you will not be surprised to learn was my idea. Languages in SFF and fantasy are frequently used for denoting the other and the exotic but WHO IS THE OTHER YOU JERKS. Is it cultural appropriation? Who is the assumed audience? What does it mean to feel like one has the right to steal another’s culture through their language? Why is it always so racist? Am I going to get very angry? Of course I am. I have like five pages of notes already. Also Guest of Honour Ambelin Kwaymullina will be on this panel and she has already been sharing with us her thoughts especially in regard to indigenous languages and it has been EXCELLENT and crunchy and you will be super sad if you don’t get in on this. Language is really important, my quokkas. I am listed on Readings Special Stream: Outside the Anglosphere, but I actually have a going away party to attend and shouldn’t have been scheduled then. The hope is that I’ll be doing that reading earlier. The point of Outside the Anglosphere is not to read one’s own work but to highlight someone else’s, and that someone has to be, as the title suggests, outside the anglosphere. I will actually be reading from (and, let’s face it, probably digressing upon) Cixin Liu’s article of a few weeks ago rather than a story. I’ve got one late-night I’ll be drunk panel: The Magical Hat of Mystery. This is in no way social justice related, though it could become so. We get drunk and answer questions pulled out of a hat and submitted before the panel begins. Other panelists are people I’ve been getting drunk with for over a decade, and when I yell at them they know I don’t mean it. On Easter Saturday morning, I impulse purchased a sewing machine. From Ikea. Not only does Ikea sell sewing machines, but they’re cheap enough (AU$79) to be an impulse purchase. Amazingly, it even seems to be a good machine — or at least, easily equal to the Singer machines I used in high school. I understand that technology has marched on, and sewing machines now come with inbuilt computers and USB ports — why? I have no idea! Give me time, though. I’ll figure this out — but this just goes forward and backwards in a variety of stitches. It’s small, but solid, and the interior parts don’t look flimsy. So now I am (re)learning to sew. In the past, I’d mess up a pattern and decide on the spot that sewing clothing was not for me. WELL, THOSE DAYS ARE GONE. (I mean, I have a job, now, and if I stuff up, I can buy more fabric and try again.) At this stage I’ve done a gathered skirt and a loose, drapey top. Both are basically rectangles sewn together. BABY STEPS. Naturally, I’ve also been looking at a lot of online fabric stores. (This is also because I like to have something pretty to look at while I’m transcribing stuff, and for some reason my employer has blocked Asos and Etsy.) And I have learnt, to my complete lack of surprise, that a lot of fabric prints are … well, problematic. Grotesquely racist is another frequently applicable term. Australia, but the general ignorance remains. So I’ve decided to do a series of posts about some of the particularly vexing fabrics that have crossed my path. Personally I don’t see the appeal in wearing the Virgin Mary on a skirt, but that’s just me. This is from Alexander Henry’s Folklorico collection, which is basically stereotypical Mexican iconography on fabric. The whole collection is deserving of side-eye, but I’ve chosen to discuss the Virgin of Guadalupe because I actually know something about it. BASICALLY, in 1531, the Virgin Mary appeared to an indigenous Mexican man, addressed him in his language, and told him to build a church on the site of her appearance. There followed a series of miracles, culminating in the appearance of this image on the man’s cloak. But there is one other good reason to think twice before you make that Guadalupe quilt. The belt worn in the original image was worn by Mexican women when they were pregnant. This is, therefore, one of the surprisingly few depictions of Mary as a pregnant woman. And that means that the image has also been adopted by Catholic pro-life movements. Now, my mum’s been a pro-life activist since before I was born, so I don’t automatically recoil from the concept. 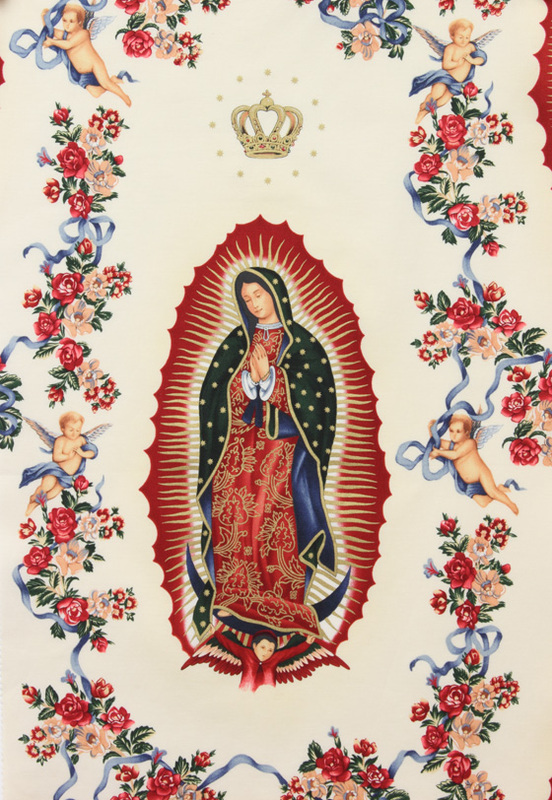 But I also don’t plan to go around wearing a Virgin of Guadalupe sundress. It’s a bit like the language of flowers — the message is only significant to a tiny number of people, but nevertheless, is it really a message you want to be sending? This month’s bird post is dedicated by me to Liz, because (spoilers) it’s all about hating birds, and I laughed. When you are told as a child to keep away from a particular bird because it is aggressive and will attack you with the spurs on its wings if you get too close to it, that information tends to adhere itself to your mind like a pervasive horror story. An aggressive bird with SPURS on its WINGS. And they’re EVERYWHERE – parks, road verges, beaches. I distinctly remember them flocking to the local swimming pool that I swam at multiple times a week, stalking the grassy perimeters and peering malevolently at children with legs nicely suitable for stabbing (or so it seemed to me). The masked lapwing, commonly known as the plover and indeed I intend to continue referring to them as plovers as that is how I’ve always known them, and I’m sure Michael will have a lot of indignation to expend on those like me who insist on calling birds common names that are completely incorrect genus designations, WHATEVER MICHAEL SOMETIMES SCIENCE IS JUST TOO OBDURATELY WORDY TO BEAR, is a terror bird in my mind. They are also, as I’ve discovered in researching this piece, a somewhat misrepresented boogeyman of a bird. It’s been quite anticlimactic to learn that plovers are actually for the most part very wary of humans, despite their mostly blasé attitudes towards living in close quarters with them. Their breeding habits causes them to make their nests on the ground in open spaces, hence why you will see them hanging out in parks, on golf courses, and airports, the latter of which where they become a bird strike risk due to their tenacity in refusing to budge from their nesting area. Plovers have, out of necessity, developed an impressive array of diversionary tactics in luring away potential predators from their nests and chicks, including loud distracting calls, pretending to have only one leg in order to appear as an easier target, and, of course, swooping and attacking with their bright yellow wing spurs. Yet these violent attacks are generally only last resorts, and more often directed at birds like ravens, and carnivores like domestic cats and dogs. Humans, it seems, very rarely experience the worst of plover attacks, and as much as I googled ‘Australian man savaged by enraged plovers’ I couldn’t find anything worse than folks getting a scare. Plovers are master bluffers, it appears. Indeed, the more I read about plovers, my fear receded into a feeling of intense pity. While they can survive in close quarters with human habitation, the stresses of ground nesting combined with the dangers of suburban living results in many plover pairs never breeding successfully. Their eggs, which blend into lawn scrub so well, are often trampled by unwary feet, or blasted into nothingness by lawn mowers. Their willingness to live among humans simultaneously protects them from traditional predators, yet opens up so many other threats. 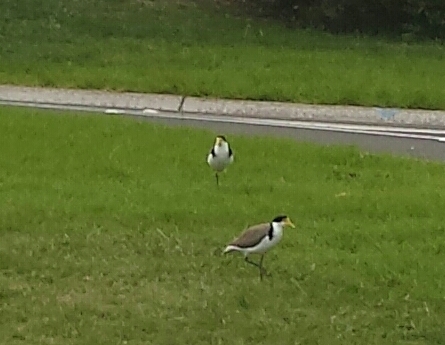 There are a pair of plovers that habitually hang around the front lawn of the house next door to my parents’. On the recent Easter weekend I went out to watch them (safely, from a distance). Apparently a breeding pair, they pootled about up and down the lawn, long yellow legs betraying their close relation to wading birds, fossicking in the grass for insects and making very occasional calls to each other, but otherwise silent as sentinels. I thought about childhood monsters, and of needlessly demonised animals, and I felt desperately sad. Steph has started us off pretty gently with this series, serving up a couple of lovable icons (galah and emu) for Hayley and me to rave over. You’d think she’d ease us into more controversial waters gently, throwing up something inoffensive we could be a bit less hyperbolic about (I’m thinking one of the honeyeaters perhaps). But no, she’s gone and assigned us Australia’s worst bird, the avian equivalent of The Room or Plan 9 from Outer Space without the camp ironic value. I’ll acknowledge that I may be slightly biased here. You see I’ve never forgiven the masked lapwing for ruining my shot at a glorious cricketing career. I moved to Caloundra as a 10 year old and signed up for the local cricket team immediately, so I could impress potential school chums with my sporting prowess. As the new kid I was quickly assigned to fine leg – a dull outfield position where you don’t see a lot of action. Unless you’re playing at Russell Barker Memorial Park, where the lapwings conveniently nest near the fine leg boundary and then spend their Saturday mornings bombarding whichever noob has been sent into their territory. Needless to say the opposition scored many a boundary down fine leg way as I ducked and weaved, failing to pay any attention at all to the game going on around me. My sporting reputation never recovered. So yes, this is personal, but I think I can still make my case. The masked lapwing is an aggressive, violent bird – don’t buy into Hayley’s nonsense about them being more scared of you than you are of them – these birds have leg spurs and they’re not afraid to use them. Read the 241 comments on this thread and tell me they’re harmless. Read some of the tips here: “avoid making eye contact or staring directly at the birds,” and: “don’t run away in a panic as this could encourage them.” These are not nice animals. When they’re not wounding adults and terrifying children, masked lapwings like to try to take down passenger aircraft – they even have their own fact sheet on the Australian Transport Safety Bureau website. These birds want to kill you and your family. Their awful shrieking call combined with their vicious spurred dive-bombing and frankly monstrous faces are enough to have me rank them pretty low on my personal countdown of Australian birds, but the point that takes them right to the bottom is their breathtaking stupidity. Masked Lapwing chicks can’t fly when they first hatch and have to stumble around foraging for food until they get their wings up to full power. So what do their parents do? Build their nests on traffic islands, in the middle of roundabouts or by a busy airport runway, that’s what. And when I say ‘build their nests’, I mean scrape a tiny divot in the ground and dump some eggs in it. No wonder many pairs never successfully breed. I was going to give them a feather or two for their ability to fake an injury to lure predators away from their nests, but why evolve such a complex skill when you could just develop the ability to make a nest somewhere other than the local dog park? Idiots. The final tipping point is their common name. 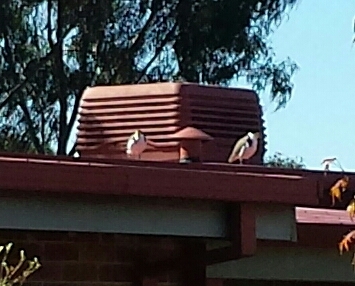 These birds *are not plovers*. They are closely related to plovers, but you can tell that they’re not actual plovers because plovers are awesome. Plovers migrate from Siberia to Australia, plovers are cute, plovers do not viciously attack young children who are merely trying to make friends in a new town by joining the local sporting team. The masked lapwing is terrible even for a lapwing, lacking the cool mohawk that gives its European cousin so much cred.